Orange County Mayor Teresa Jacobs, Congressman John. 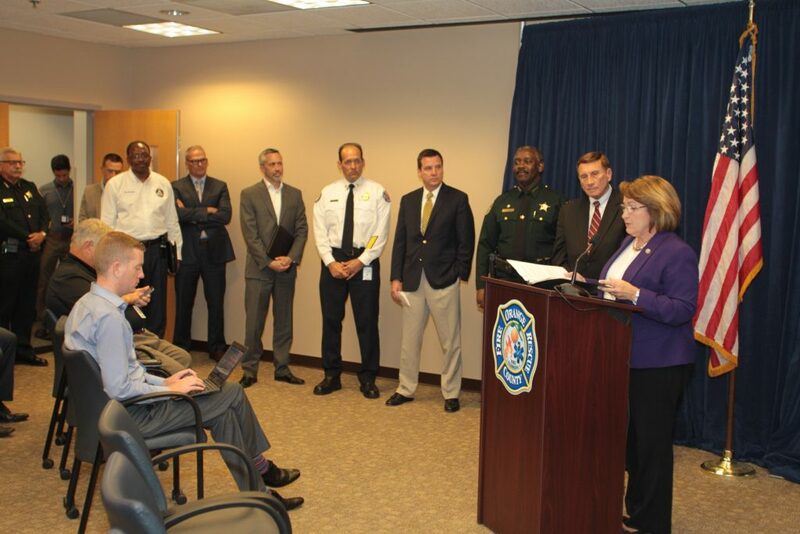 L Mica, Orange County Sheriff Jerry L. Demings, the Orange County Office of Emergency Management and additional Orange County leadership hosted a press briefing on October 5, to deliver the latest updates on Hurricane Matthew. ORLANDO, Fla. – Orange County’s Office of Emergency Management is advising residents to stay vigilant and informed as Hurricane Matthew approaches the state of Florida. The latest projected storm path indicates Orange County and eastern neighboring counties may be impacted as early as Thursday evening. At this time, Orange County has activated to a Level Two, which includes bringing in additional support personnel for preparedness efforts. Activation levels may adjust as the storm approaches. Citizens are being asked to finalize preparedness efforts to include: ensuring that any loose items in yard or home are secured; make sure that emergency supply kits are stocked with water and nonperishable foods enough to last 3 to 5 days. Please top off vehicles with fuel. Consider visiting the ATM, prior to any potential power outage. Check on neighbors, particularly seniors and those who may have special needs. Finally, please bring pets inside and ensure the safety of livestock. For Hurricane Matthew updates, visit www.ocfl.net/Matthew. Sandbag distribution at the Goldenrod facility is at capacity – citizens are asked to go to alternative sites. All Orange County Public Schools will be closed and activities cancelled through Sunday, Oct. 9. Please visit www.ocps.net for information. Garbage, recycling, and yard waste will not be collected in unincorporated Orange County on Friday, October 7. Friday routes will be collected on Saturday, October 8. Please remove empty garbage and recycling roll carts from the curb and secure any loose items. Courts in Orange and Osceola counties will be closed Thursday and Friday. The Central Florida Expressway Authority has announced that tolls on the 528 have been suspended until further notice. Today, Orange County Fire Rescue issued a “Code Red Alert” to 54 mobile home parks that have been identified to be in areas with the potential to sustain hurricane-force winds and heavy rainfall. No evacuations have been ordered for Orange County residents; however individuals who live in mobile homes are encouraged to closely monitor the storm and be prepared to find alternative residence if needed. Orange County is working to open several shelters to accommodate residents who feel that they need safe haven, as well as individuals form Brevard County or other impacted communities. These announcements will be made once finalized. Shelters will NOT open today, Oct. 5. Sandbag Distribution – Orange County Public Works has already distributed more than 10,000 sandbags. Sandbag distribution will continue at seven remaining locations listed below on Wednesday, Oct. 5, from 7 a.m. through 7 p.m. On Thursday, Oct. 5 sandbags will be distributed from 7 a.m. though p.m. Residents are eligible for up to 10 sandbags per vehicle. For information and locations, visit www.ocfl.net/ocsandbaginfo. John Young – 4200 S. John Young Pkwy. Residents are encouraged to visit www.ocfl.net/Matthew for the latest Hurricane Matthew information as it pertains to Orange County. Orange County Public Works, Stormwater Management Division is proactively checking drainage infrastructure to include stormwater drains, canals and ponds as well as other sites in anticipation of potential heavy rainfall in Orange County. In addition equipment to remove debris and tree limbs is being inventoried and tested. Download Orange County, Florida’s OCFL Alert, OCFL News, OCFL 311, OC ALERT mobile applications for free on Apple and Android devices to receive emergency management communications and to stay informed before, during and after a storm, use our mobile apps. OC ALERT is an alert system that allows Orange County Government to contact you via email or cell phone text message during an emergency affecting Orange County. Register free-of-charge for OCAlert, https://ocalert.net. American Red Cross Emergency App – Monitor conditions in your area or throughout the storm track, prepare your family and home, find help and let others know you are safe even if the power is out.